Yes, it used to be a great spot for a panoramic photograph. Thank you for stopping by! I am so busy these days, no time for anything personal. Looked at the majestic sunset, and went home 😦 It must be lovely in Tramore tonight. Thank you so much for your visit, Sarah. This time the government cannot be blamed. It is a tenant company who were supposed to move in, but had no money for that. The case is in the Court since 2008, and the tenant company has already paid 20M in fees to the builder… Probably no one else can move in before they sort it out. I never knew about the blaa, but having lived in different parts of the UK, I’ve observed the many different names bread has (and the different shapes it comes in). How sad and weird the ghost buildings stories, especially the wasted money of the new ones. 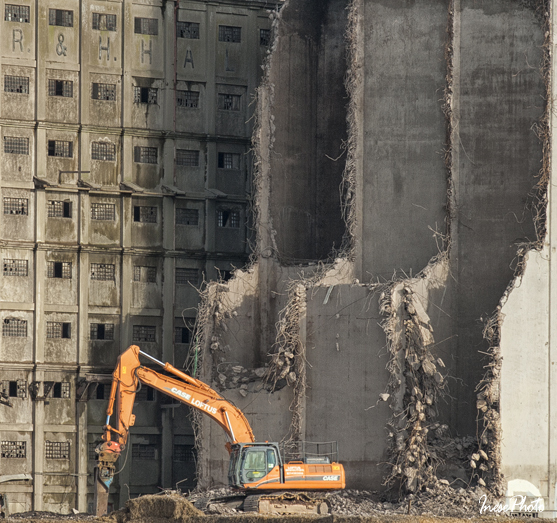 Near Sheffield, they tore down an power station and although it was an eye sore, it caused controversy in the end. The blaa is just a regular bun, but the name is unique and protected by EU law. I suppose many cities have ‘ghosts’ and Waterford seems to have its share. 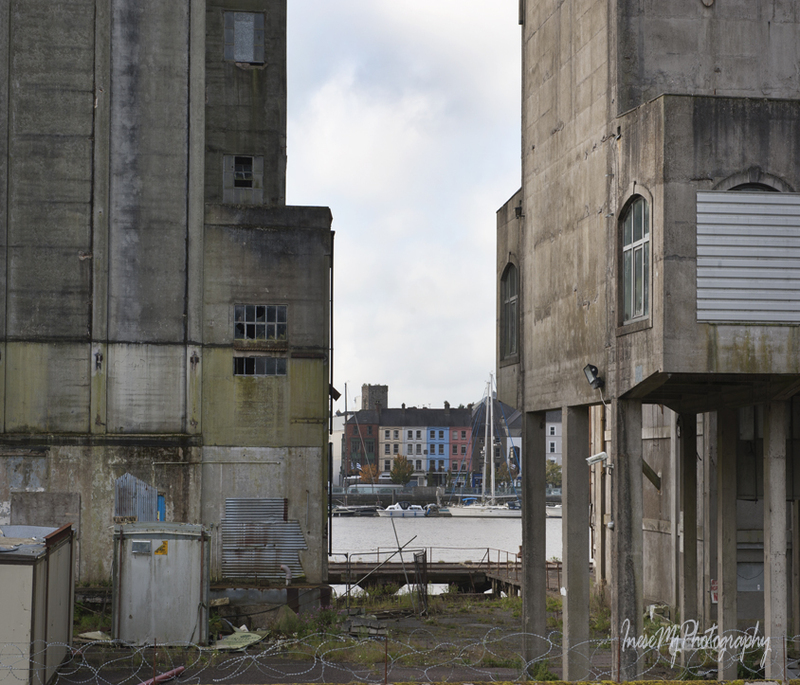 The mill was a bit of an eyesore, and I can see how it ruined your photos. 🙂 But the old part built in 1905 will still stand, which is to be expected. We have conservation orders on so many old buildings. I’d never heard of a blaa, so that’s something I’ll look out for, if we get to Waterford next summer. The one filled with bacon looked so tasty! For some reason I missed your reply to me here! I would be delighted and honoured to meet you in Waterford next summer. I’ll let you know when we’ll be in Ireland as soon as we’ve booked it. I’m hoping we may find somewhere in the Cashel area again. The countryside is so beautiful there. It was 2002 when we were there. We all loved the whole area and have been saying we’d go back again some day. Well, next year’s the year! I’m really looking forward to it, and meeting you would be a wonderful bonus! Lovely images, Inese – the last one is especially impressive! Indeed..they hold history too. The mills in Rdam was built before the WW2. Yes I still live in the US for the next two years I guess. We will see how it goes with the politics here. So far Minneapolis seems a good and progressive city to live. But I don’t plan to stay longer than my husband’s initial working assignment in the US. We will see. I do miss Europe..we will be back in the Netherlands for Xmas this year. Hope all is well with you, Inese.. Thank you Indah, all is reasonably well here. Another interesting blog – never heard of Blaa and its history – loved your image of the Supermoon especially! Didn’t get to see the moon in her glory 🙂 The clouds wouldn’t go away. 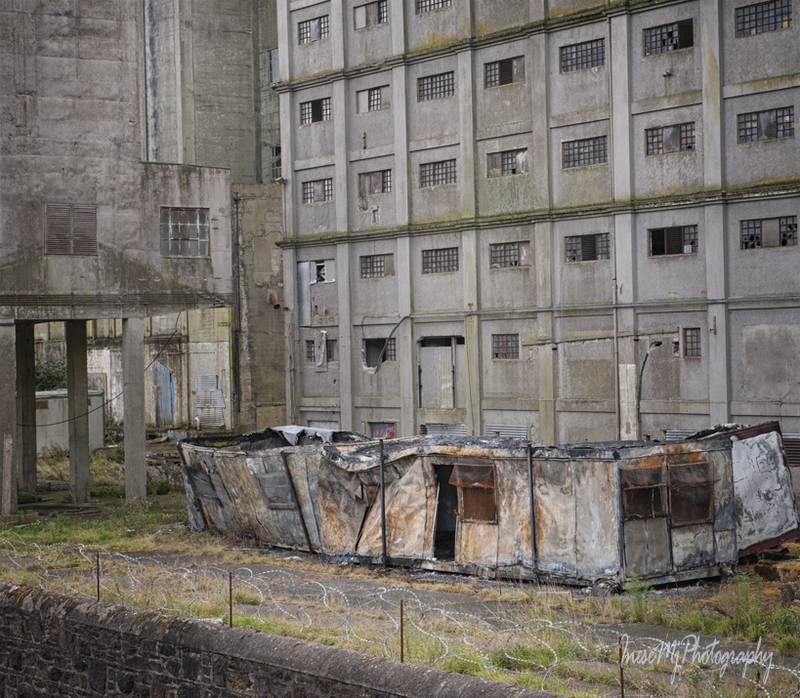 Astounding – those torn down and abandoned buildings! Yes, such a huge complex, fourteen silos, nine storey buildings. Yummy! The soft blaa makes a fine sandwich, I’m sure. Would the crunchy blaa be for dipping into soup or coffee? I know. But if ever you are over here………. 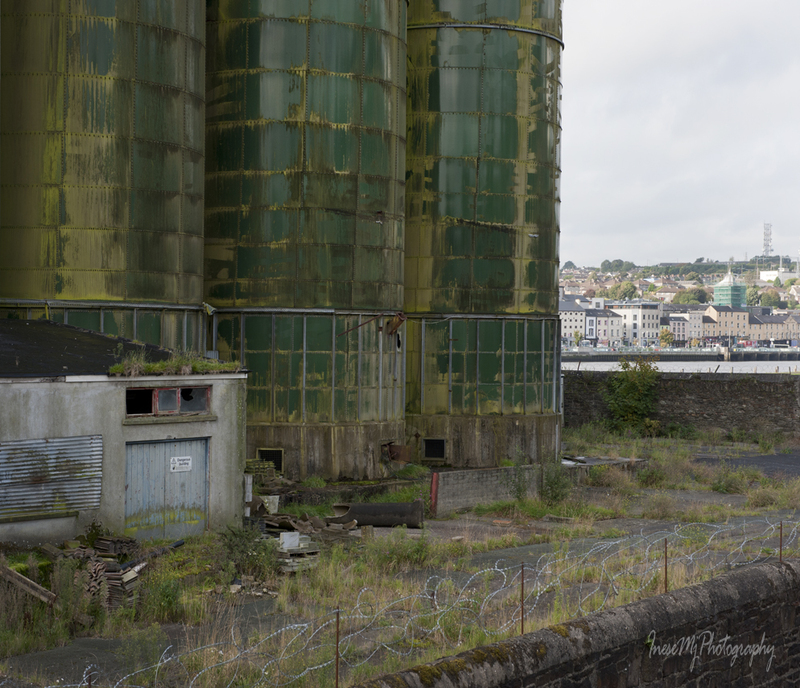 This is somewhat too bad about the flour mills, Inese. Although they ruin photographs, they were part of the trade and local places to work. I am sure there was pride to them. 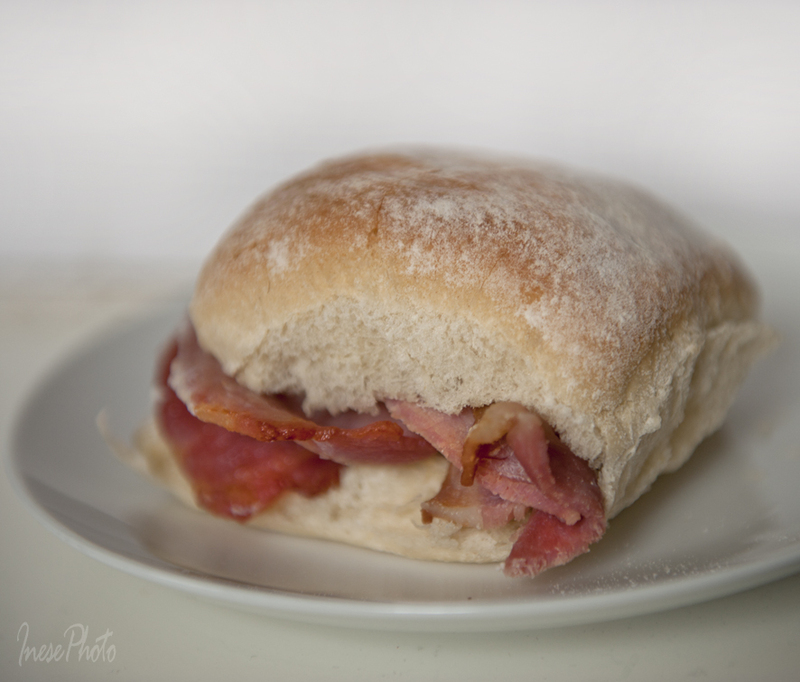 The blaa, with the bacon on it, looks quite delicious! I love how it is called “rashers,” there. Wonder when and how our use of a rash being red and pus-y came about. . . !? The best photos (my favorites) of the tall ships at day and night; with the bonus of full supermoon in the sky, were gorgeous! Thank you so much for your comment, Robin! The mills were closed down some twenty years ago. Once it was the biggest employer in the city. Very nice! 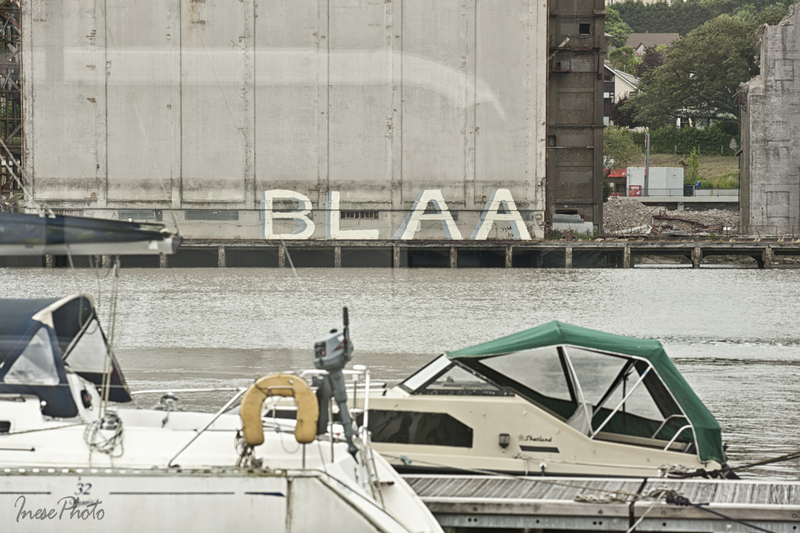 I never heard of a Blaa – maybe they’re not big in Cork. Not that I went in many bakeries I guess. No Blaas in Cork. Only a couple of South Kilkenny towns and villages, on the very border with Co. Waterford might have blaas in their shops. On a heretical note the blaa bears an uncanny resemblance to the ‘Hawick roll’ from the Scottish borders. I like the west- coast black topped ones of my childhood. I will bear that in mind. Thanks Inese. Wonderful post Ms inese … if only I could eat bread … I’d be all over these like stink on a monkey. Whew …. Oh my … can it get any better? Well, a blah on the tearing down of that which once created Blaa! Thank you for this interesting look at the past & progress… which may not be humanistic progress, but stock market progress. Inese, I’m not sure what to say, but i raise my simple Canadian grilled cheese sandwich to you, and Waterford! Resa, your grilled cheese sandwich is perfect, and I am really happy that each place has their own food which adds a lot to the pleasures of travels. Inese, I look forward to trying a blaa when I get to visit Ireland this summer!!! I’m so excited. This summer?! So exciting!!! Is there anything I can help with? It’s a golfing trip–everything planned for us, but I might need advice on clothing to bring and foods to try (or avoid). We still don’t have firm dates. Let me know. I wonder what part of Ireland it is. Must be Cork&Kerry, somewhere. Someday I’ll have to try a blaa. Interesting word. And thanks for the photo of the supermoon, Inese. 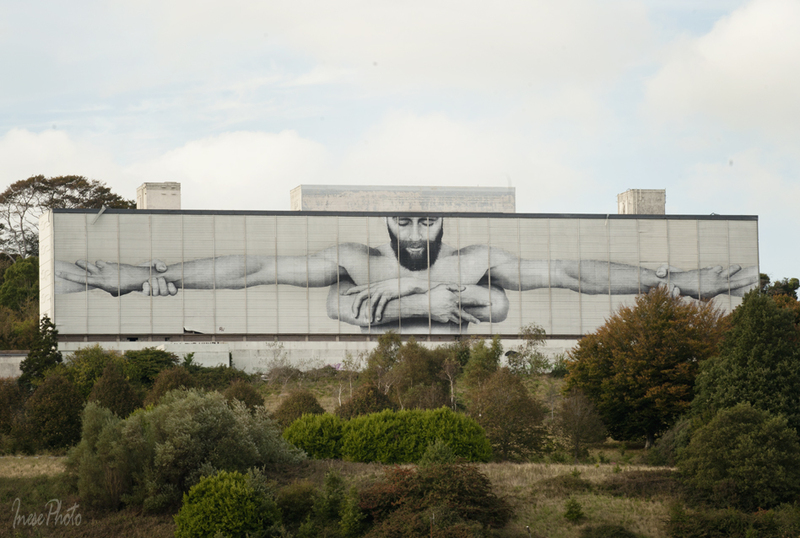 It really must be seen in context to get an idea of the size, so that was wonderful! Thank you so much, Diana! The moon was at her best shortly after 5pm, but I came home much later, and missed a lot 🙂 I haven’t noticed a big difference in size, but the brightness was remarkable. Unfortunately the moon was in the clouds most of the time, and I simply enjoyed the view without taking photographs. EU protected the ‘blaa’ word by law 🙂 If you decide to bake the same bun, say, in Dublin, you have no rights to call it blaa. I am learning about “Blaa”. From the look of it, it looks like sour dough bun. Blaa and the rashers look so good. If I have an opportunity to visit Ireland next time, I will try to look for one. I hope they are not hard to find. I am fascinated by those old time sea travel ships as these. Are they still operational? If they are still in used. What kind of purposed are they serving today? 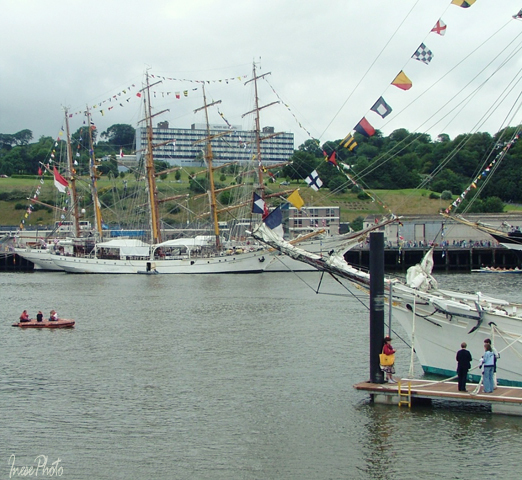 I have attended two Tall Ship festivals in Waterford – in 2005 and 2011. I think the next one is in 2018, but I might be wrong. 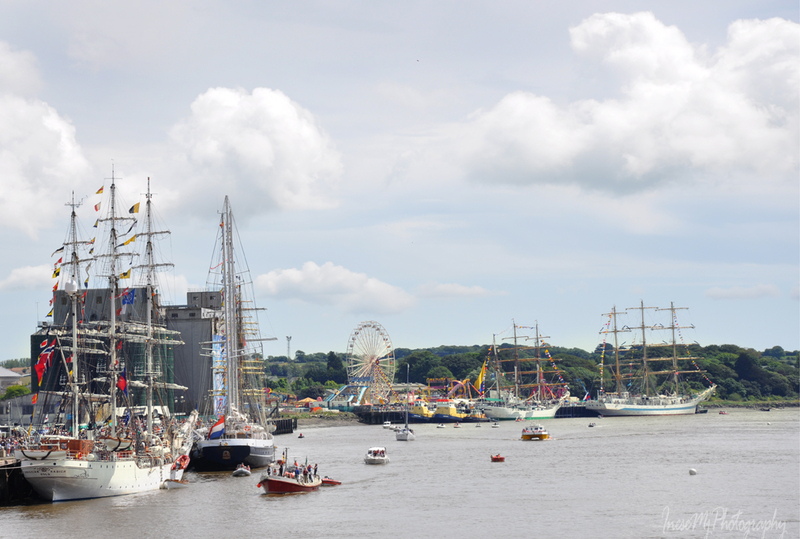 In 2005, more than 100 ships came to Waterford from around the world. The purpose of them depends on the ownership – it could be leisure and travel, or they can be used for training. Many of them have been filmed in various movies. Thank you for the information about Blaas and the ships. Interesting place and the local food made it all real for me. What happens to folks who use a knife to cut into their blaas? We didn’t get to see the super moon – fog – your glimpse of it is lovely. I am saddened by the torn down buildings and the loss of jobs. I hope there can be a revival in the area. I to hope they open the shopping center and create a few jobs. Unemployment is not as bad as it was 3-5 years ago, but still it is a problem. Thank you so much for stopping by! Hotel will go next year, after the Mills. 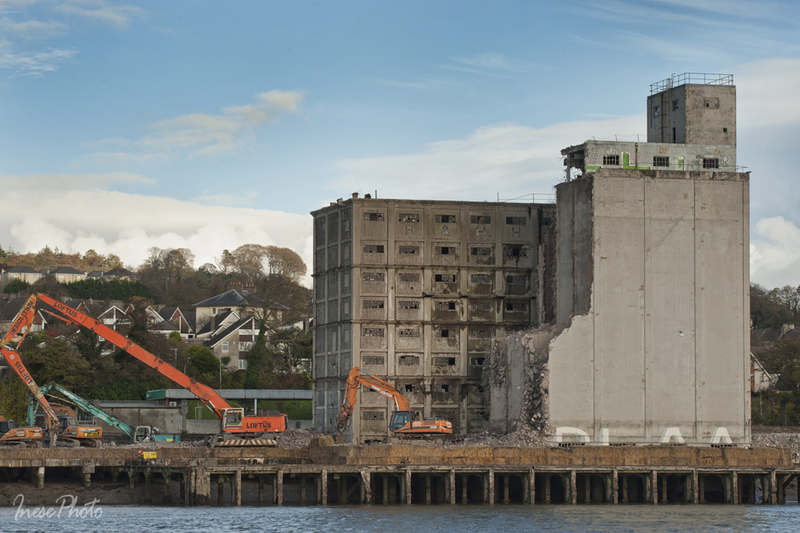 The shopping centre has an anchor tenant – Dunnes Stores, who already lost 20M to the developer in court, but still have no money to launch the mall. Blaa! Or perhaps ‘blah’ my accursed internet is denying me some of the photographs…so much for the high speed internet I pay a King’s ransom for! That said, a fine, fine read. I shall revisit come morn. Ah, dang it, may be you just have to reload the page. The blaa is a Waterford thing. There are two kinds of them – with a soft and a crunchy crust. The one in the picture is the soft variety. They say that the name derives from a french word for white bread. French white bread is the only white bread worth eating. Fresh in the morning, dry thereafter as quality bread should be! As to my internet ‘reload/refresh’ does nothing…we’re paying a small fortune for a rubbish service. Will, as promised check out in the AM. Oh I will never forget French bread, and food in general. Today I get to see your super photographs…at last. 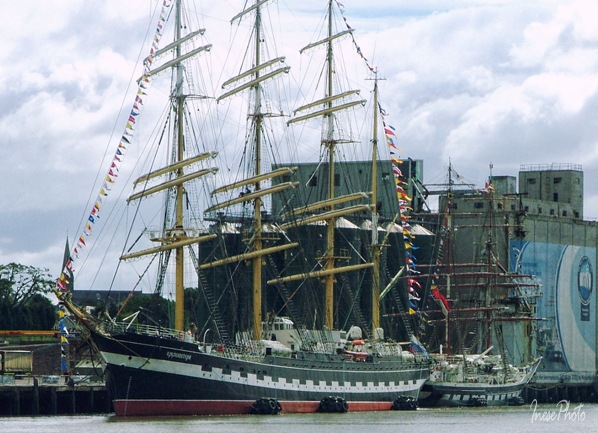 By way of a coincidence and if I’m not mistaken that Russian tall ship is the self-same one I took a snap of in Folkestone Harbour two summers ago! Plainly, my snap not as good as your photographs! I must seek out the photo’s. It was in the marina right opposite where we were taking coffee. I shall report back! Italian bread is the same; very fresh in the morning and hardish by night time. I put this down to a lack of preservatives (I hope). So is Blaa. Wouldn’t keep it until morning. Good point and you are 100% correct. Sugars and other unmentionables preserve this stuff we call ‘bread’ in this here island. ‘Bread’ that stays ‘fresh’ for days on end. Then we wonder why our rate of type 2 diabetes is ever going up. Too true but we could have such a long conversation on preservatives, additives, sugars, etc., in our food today. Since I gave up rubbish food and took up serious exercise I have been out of the diabetic zone for 5 years. The plus is also that proper food works out cost efficient…if only people cooked and gave up takeaways! Wow, that is impressive! I’m not a takeaway person and rarely have one. I love cooking so it’s not a problem for me and at least I know what’s going into my meals. I never thought the word blaa would get me excited, but that bread looks delicious! I enjoyed the rest of the tour…especially the Super Moon shot…fantastic. 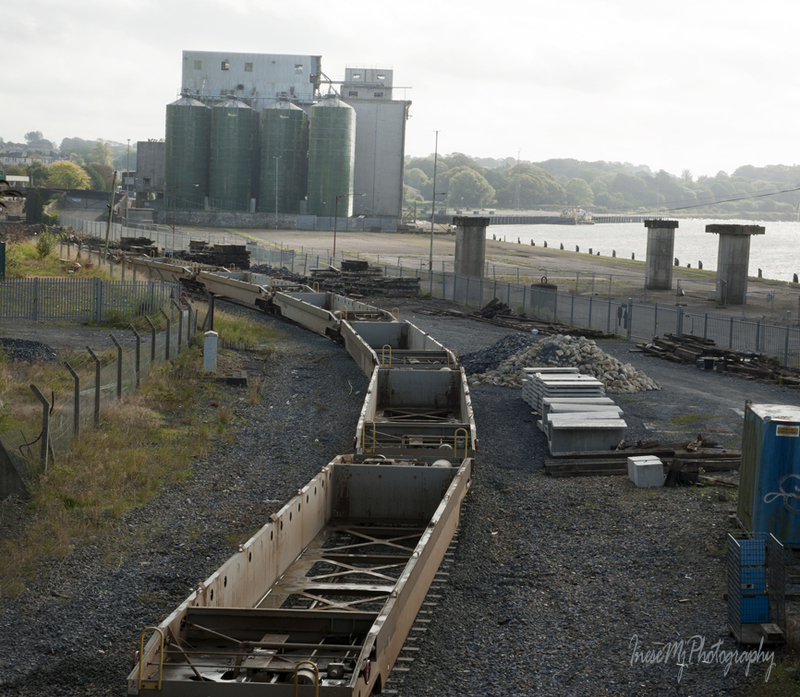 I very much enjoyed this stroll around Ferrybank, Inese. 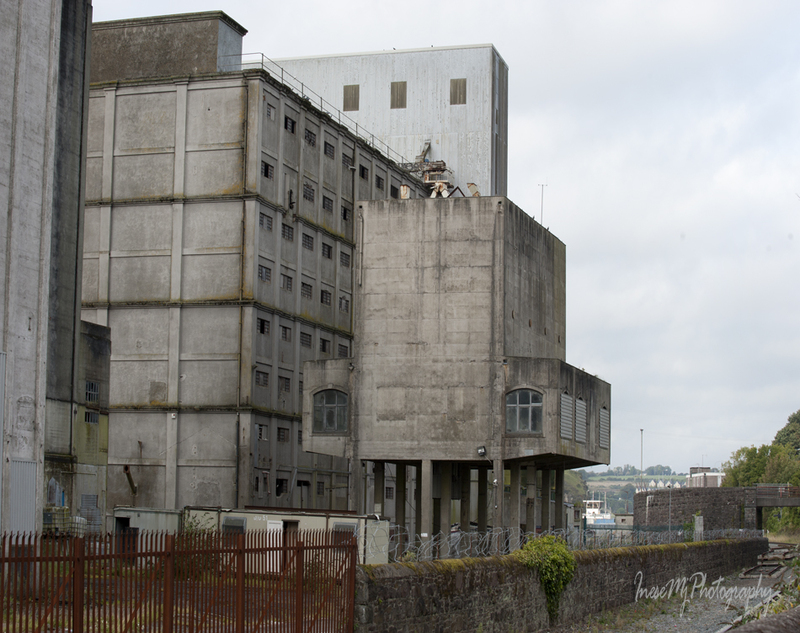 Interesting story about the blaa and the mill; and the economy of the area is sobering. I really liked all of your photos, as I always do. Thank you so much! That blaa graffiti made me smile when it appeared last year. Some day I will take a picture of the vertical cliff, another place for the teasing messages, that is really dangerous, and not fun at all. These messages appear year after year, and regardless of the police efforts no one knows who does it. Thank you for joining me Christy 🙂 It was quite a walk indeed. 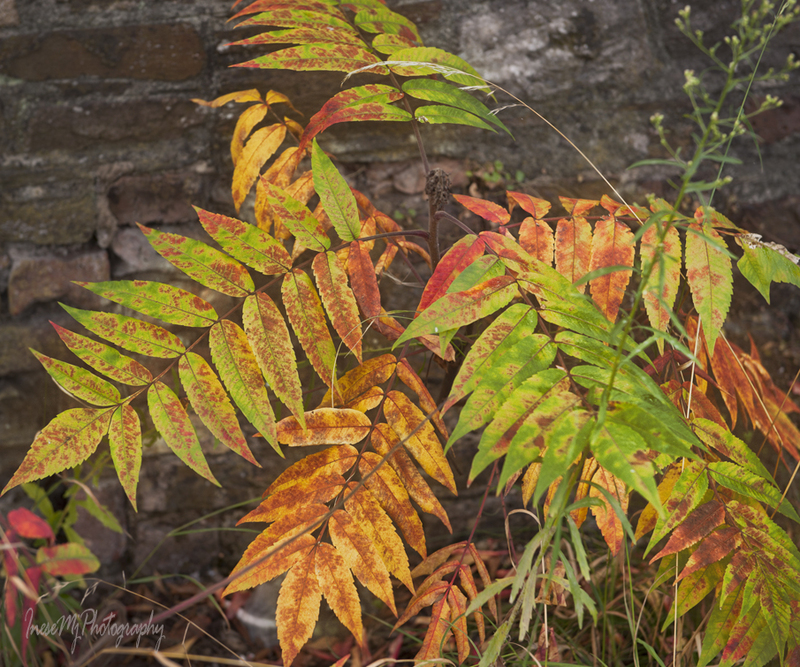 Most of the pictures are taken last fall. I left my car with mechanics and declined the offer to take me home because I didn’t realise how far it actually was. Good that I always have my camera with me. Haha, right away you had me hankering for bread. I do love bread too much… I hope you are feeling well now — happy and sassy. Such contrasts in this post, Inese. The bleak mill buildings (OMG it was huge) and the beautiful ships. 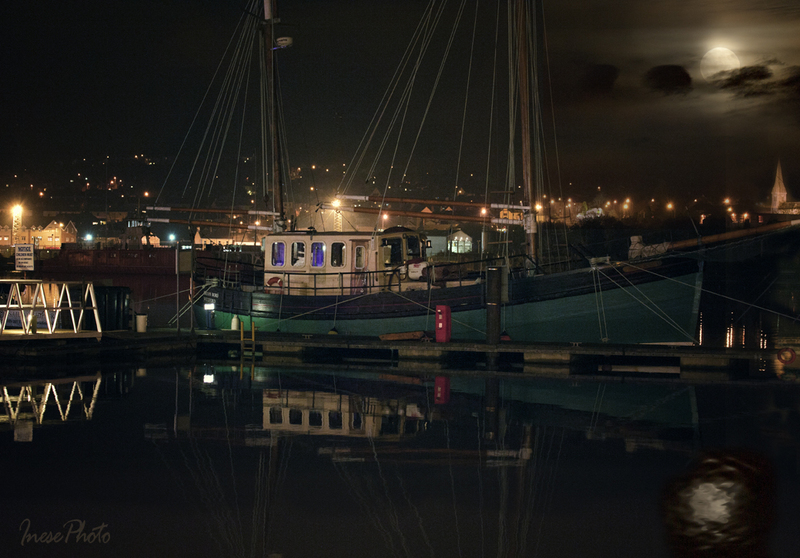 I especially like the last photo, Super Moon shining through the clouds, the lovely boat and reflection, the lights. It makes it seem a magical evening. I enjoyed this stroll. Mega hugs. Thank you for stopping by, Teagan! 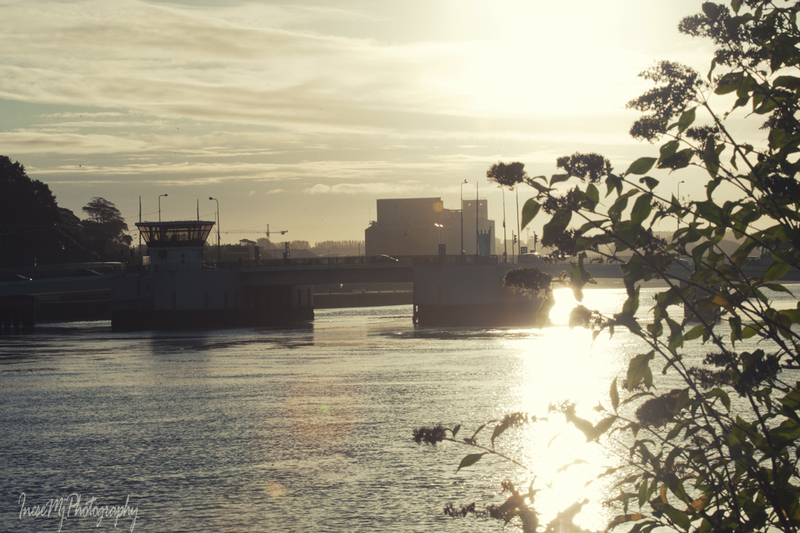 This part of the city is special. As to the blaas, I am a huge fan 🙂 Many hugs.